You're getting out there and having a blast, knowing that your rig can take a hit. You and your toy are coming back home after conquering that huge boulder or gnarly hill. You're ready to get out and do it again! That describes an R&W customer. Simple bolt-on safety devices and guards can't perform like solid WELDED steel can. Engineered .120 wall DOM steel tubing (.250 wall for links) and bulletproof armor plating can take a BEATING like no other! Call or email us for free information and a quote today. 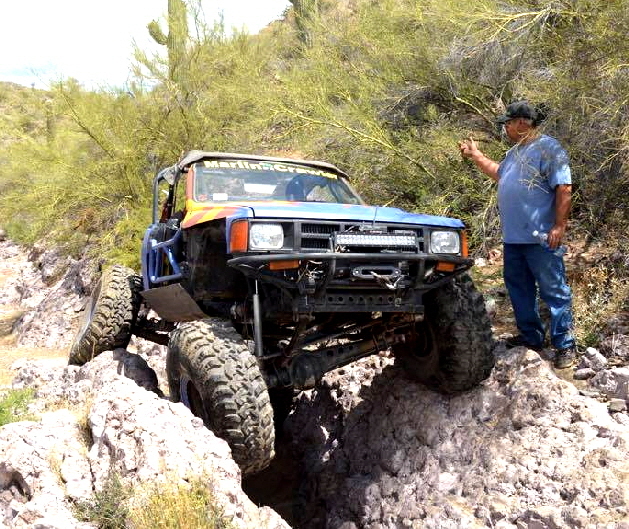 Pictured to the right, Robert Wonsey guides a client through the crack on the Die Hard trail in Table Mesa, Arizona. That crack has chewed up and spat out many vehicles. On this day, the client tested his new armor-plated boat sides (angled steel under the doors) and got through with no problems. ROCK SLIDERS - ANY VEHICLE. Made from 1 3/4", .120 wall tubing, these welded tubes rigidize and buffer the impacts to your fragile rocker panel area under the doors. Minimize the chance of doing frame and door damage! 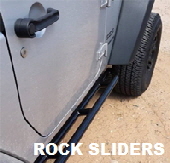 Rock Sliders allow you to put the bottom side of your door area directly onto large boulders and slide your vehicle across the rock to the other side. 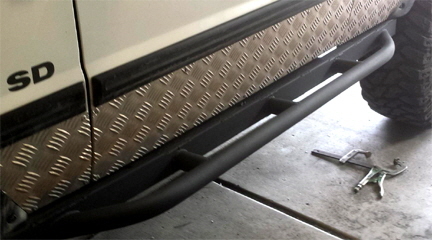 Rock Sliders also offer greater protection for higher up on your doors by helping to prevent your vehicle's sides from crushing up against rock walls or sliding down rock faces. When you want to keep the rocks under your doors, Jeep Rock Sliders are the way to go. Make sure to have them custom-fit and welded into place for the best performance and durability! 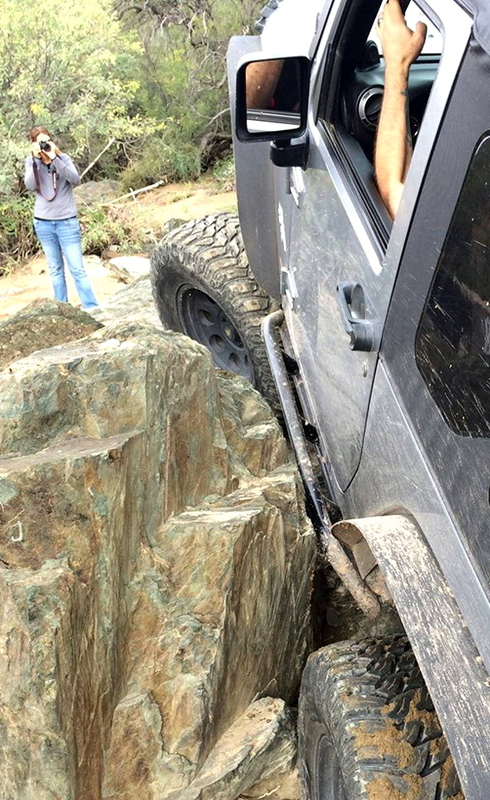 JEEP Rock Sliders allow you to drive to challenging places, reducing the fear of smashing doors. 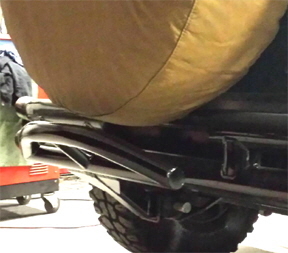 Rock Sliders are welded into place for the toughest construction possible. Made from 1 3/4", .120 wall tubing, these welded tubes rigidize and buffer the impacts to your entire vehicle. 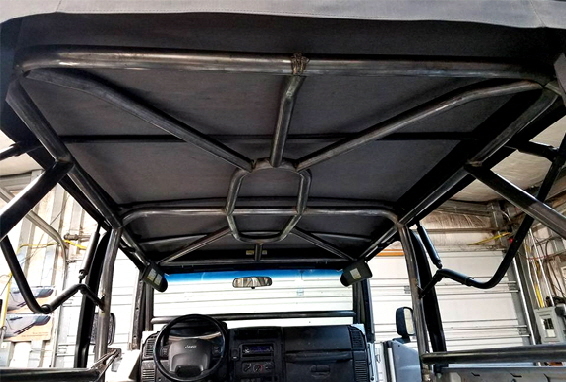 Roll bars are best when welded directly to strong steel and chassis sections of your vehicle. Never rely upon bolt-in units! 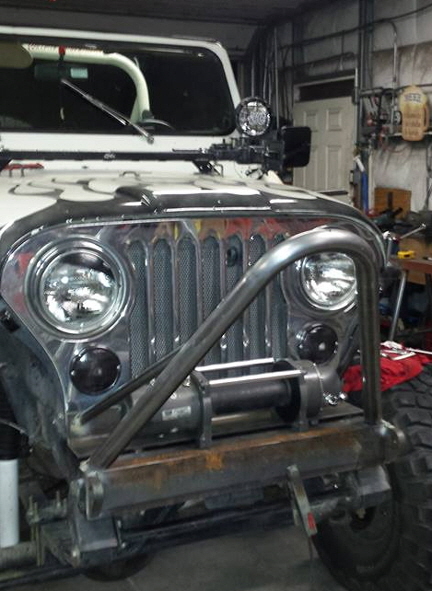 Welded steel roll bars can help to save your life and your vehicle... and they look cool, too! The extra rigidity that roll bars provide can also help to improve handling, on and off road. Roll bars are also great places to mount other safety devices, like fire extinquishers, medi-kits, and shovels. If you're going to engage difficult terrain, make sure that you come back in one piece. 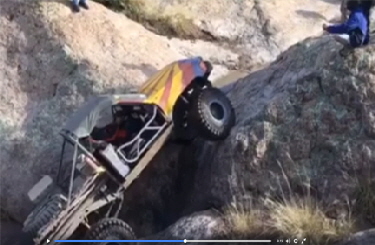 Make sure that your Jeep (any 4x4) can take the beating that you know you're going to give it. Prepare for hazards and improve safety! Explore where you couldn't before! OUR STINGERS ARE MADE TO PERFORM. Our clients GET OUT THERE. The driver of the Land Rover, pictured above, has bounced that Stinger off of the bottom of a steep descent, happy to have the support. Others have pushed the limits with their Jeeps, Samurais, and Toyotas to the point of needing to touch up the paint from time to time. Keep the top side up! 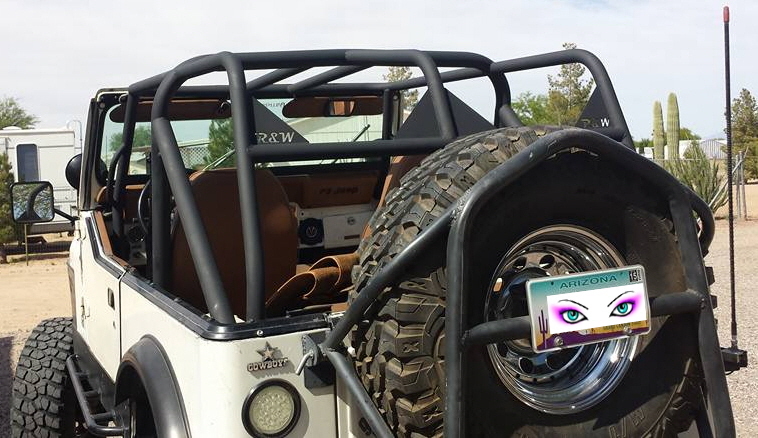 Custom Rock Sliders, JEEP Armor, Boat Sides, Stingers, Bumpers, Roll Bars, Trailer and Buggy Chassis Fabrication made in ARIZONA. ARE YOU READY TO GET SERIOUS?! Made from 1 3/4", .120 wall tubing, these welded tubes and plates are permanently welded. Stingers help to minimize the chance of a forward flip when descending steep grades. 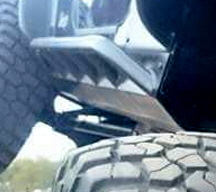 They also make it easier to see where your front bumper is, in relation to rocks and other obstacles. Make sure that YOUR stinger is welded on! If you just use a bolt-on unit, you can't be assured of the strongest support. This client has dropped the full 3000 pound Toyota truggy onto the Boat Sides from a 2.5' height onto a pointed boulder and didn't even dimple the bulletproof armor. VERY tough. This is the truggy with the boat sides seen to the right. The incredible clearance through V-shaped gaps allows it go up obstacles like this with no scraping and little effort. SUSPENSION - 3 LINK, 4 LINK, HEAVY DUTY AXLE DESIGN AND TRUSS REINFORCEMENT. 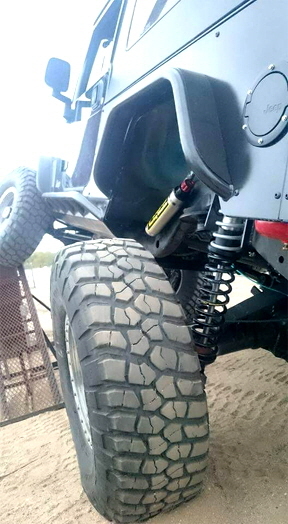 Dramatically improve how your trail rig, Jeep, or rock crawler buggy articulate and take on the terrain. Years of personal driving experience and ramp competitions has honed how we can make your truck take on the biggest and baddest that Mother Nature can throw your way! Super Duty designs to take the hits, climb the rocks, and articulate across boulder fields. When you're ready to take your rig across the nastiest nasties, give us a call. 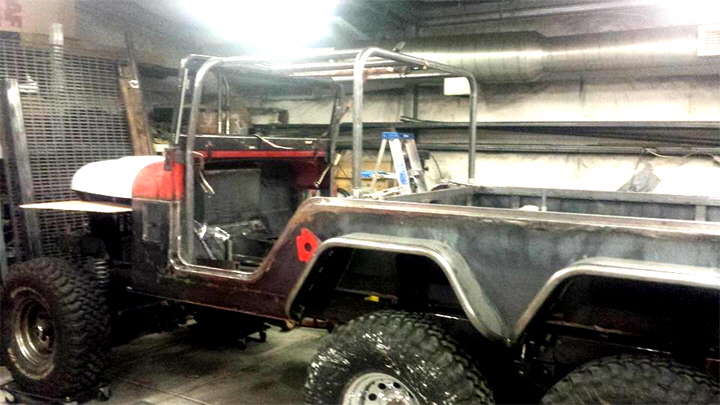 We are the guys that make the 6x6 Jeep that you may have seen at events and other places online. 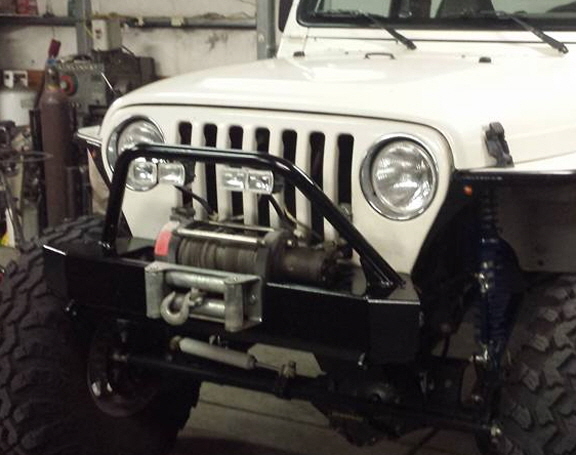 We built it from scratch, fresh frame, articulating custom axles, and full SIX WHEEL DRIVE. We can take on your four wheel drive, no problem! ACTUALLY DRIVE OVER OBSTACLES EFFECTIVELY. It is amazing how much more traction you can get with proper articulation. You can keep more rubber in contact with the terrain and get through. Do you already have a set of axles that you got a good deal on? No problem, bring them by for modifications and installation. This is the 6x6 Jeep that you've seen in magazines and local shows like the 4 Wheel Parts show, summer of 2016. It's now off to be painted! Below are some of the build pictures. It can take 4-12 months to custom craft a unit for you, depending upon what kind of unique features you request. Can you image what it would be like to own a 6x6 Jeep, made just for you?! These radical rigs generate smiles for miles as you motor down the road and on the trail. The fun is beyond compare! We are the guys that make the 6x6 Jeep that you may have seen at events and other places online. 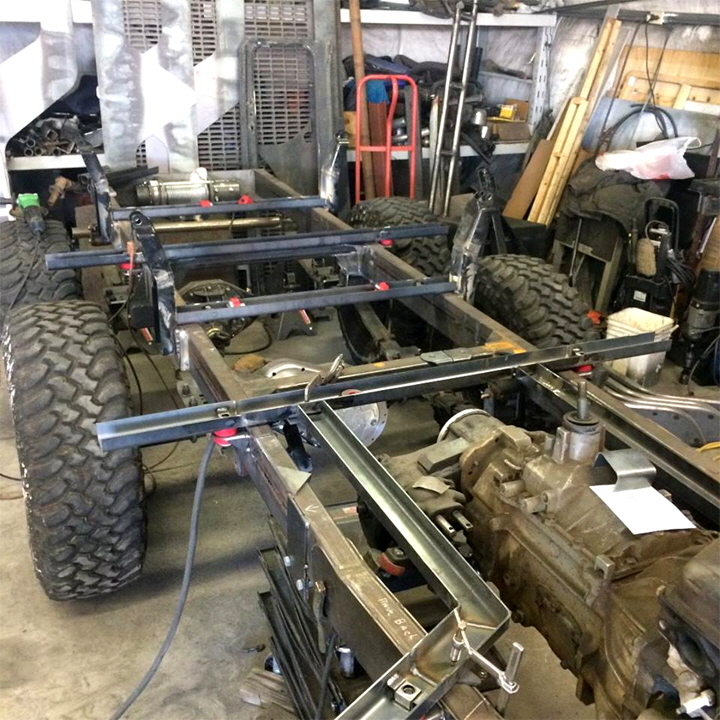 We build them from scratch, fresh frame, articulating custom axles, and full SIX WHEEL DRIVE. 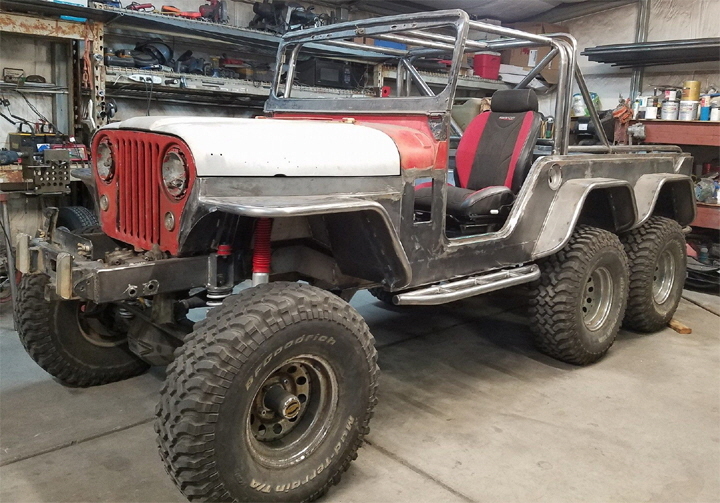 We start with an existing, street legal Jeep (that you provide or have us purchase for the project - other vehicle types available), then build up a fresh frame with super-tough axles and design the cabin and compartments to suit your own personal tastes. So, why do YOU want a 6x6 Jeep?! 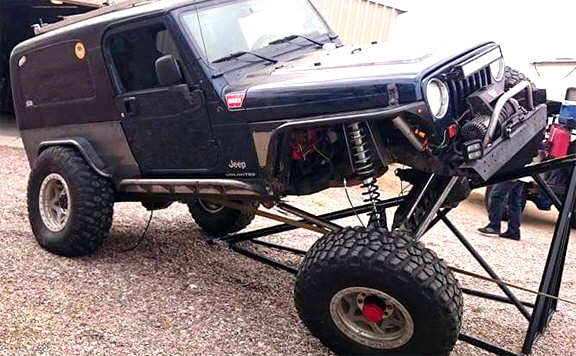 They're the most unique rig, on or off road. They can carry large loads of equipment and camping gear. They can go just about anywhere. They're a big hit at car shows... and the ladies love them! When you need that hauler to tow that crawler, we have the experience to set you up the right way. Years of trailer construction. and personal use of RV campers attached to them, has taught us how to help our customers get there and be secure at night. 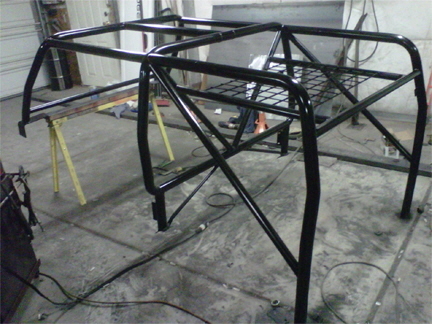 We also fabricate custom trailers for any type of use and custom flatbeds for your truck. We also modify existing trailers to suit your needs. Headache racks, too! 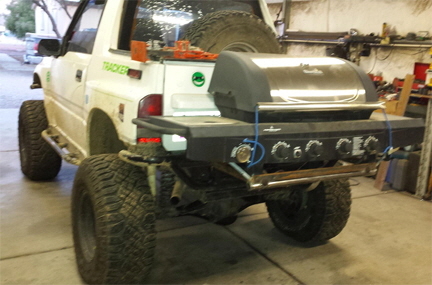 Custom off road trailers, made to your liking. The driver of this Toyota truggy had boat sides added under the doors, but also needed the chassis to be modified so that it was easier to get to the tool box on the trail. The original chassis had large 'bat wings' that went all the way to the roll bar, interfering with the truck's ability to lay on its side and get around huge rocks. The rear of the chassis works much better now. Popular in Southern Arizona, this Nissan Exterra is known as Rockterra. The driver of this awesome rig pushed it past the point of crunch and wedged it into a crack quite nicely, munching the fenders, doors, and such. Sparks even flew out of the electronics that fed a headlight! 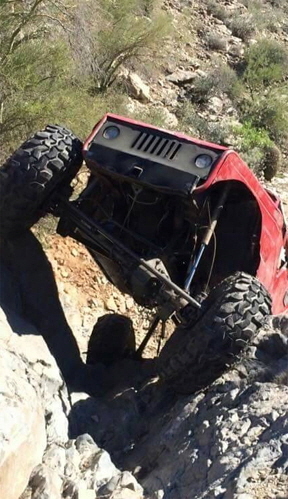 When your rig has given its all, don't give up on it! The Rockterra has emerged triumphant as a buggy like no other. 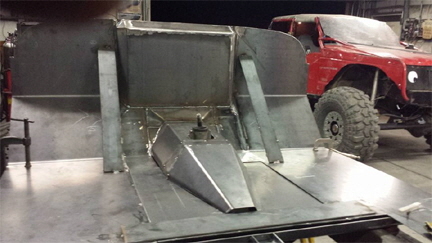 Super tough, 900 pounds lighter than it was before, boat side armor... the works! Your rig has treated you right... resurrect it after the big crunch! Southern Arizona is now Rockterra territory. 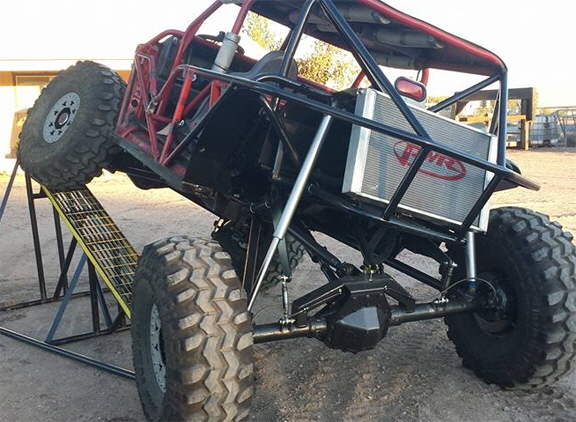 We can build a full-custom buggy for you or convert your current off road rig into a serious buggy rock crawler, unmatched on or off trail. 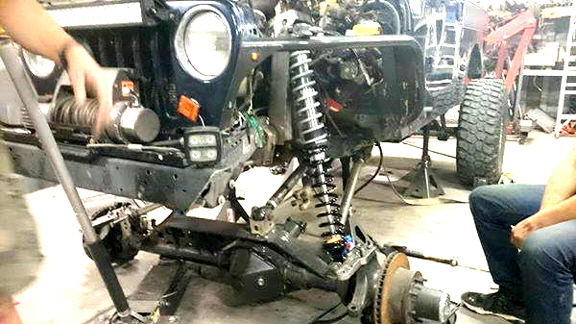 We also modify existing buggies, Jeeps, and rock crawlers to satisfy the customer's needs. DOM, chromoly, and cold rolled steel tubing get the job done. 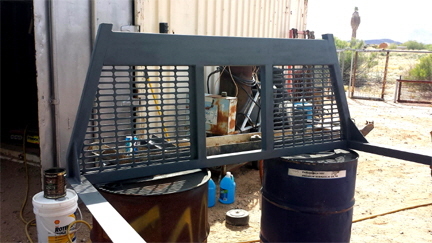 We do armor plating where needed and use trusses to reinforce. Durable MIG and TIG welding. Made from BULLETPROOF ARMOR, boat sides are like the HULK VERSION of Rock Sliders. Often, clients have us do a hybrid where angled armor Boat Sides are incorporated into a more traditional Rock Slider design, offering the best of both worlds. 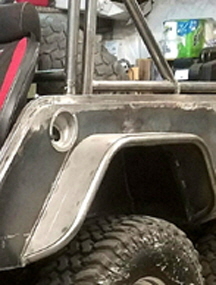 Buggies tend to have boat sides that are designed to perform as Rock Sliders, but much more body is cut away, or there is no body at all, just a chassis to mount to. 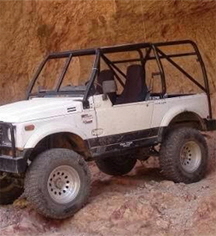 A vehicle with boat sides is more capable of climbing rock waterfalls, able to lay the vehicle onto its side a bit and slide up and over huge ledges. Boat Sides can also take a tremendous beating, taking a hit from the entire vehicle's weight dropping onto them! 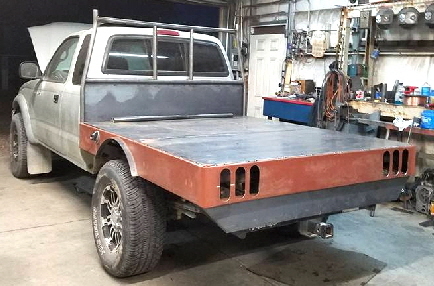 HEADACHE RACKS AND CUSTOM FLATBEDS. 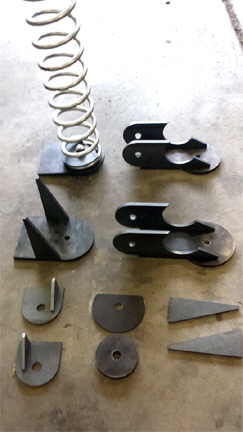 Custom Armor and Specialty Off Road steel fabrications. 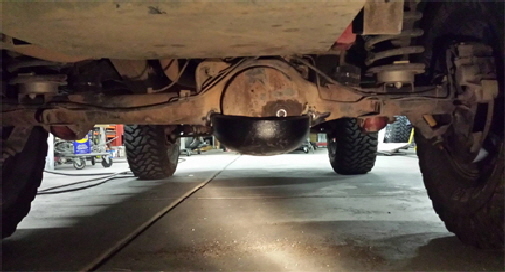 Even if you just need some tough protection for your differential and/or its cover, come on in. Our sewer pipe end-cap modification is affordable and CRAZY-TOUGH at 3/8" thick steel. This diffy cover can't be beat, but it can be beaten on! 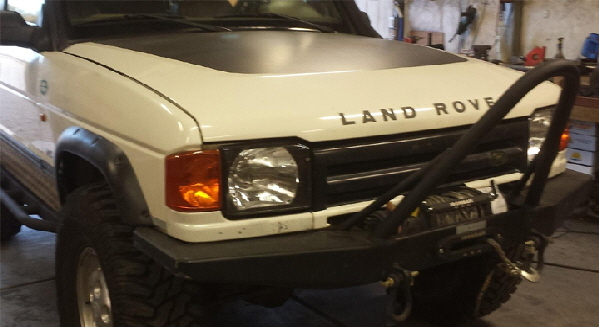 (Below, on Discovery Land Rover). 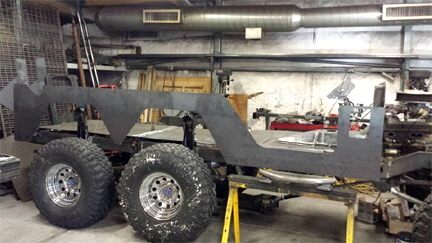 What other specific fabrication needs do you have for your off road truck or buggy? Out for a Special Delivery. 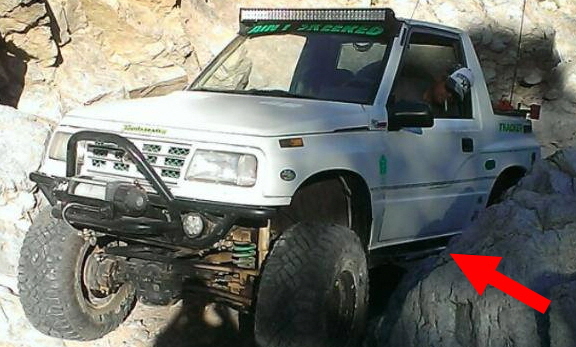 Do you want one of these rare rigs in YOUR driveway? 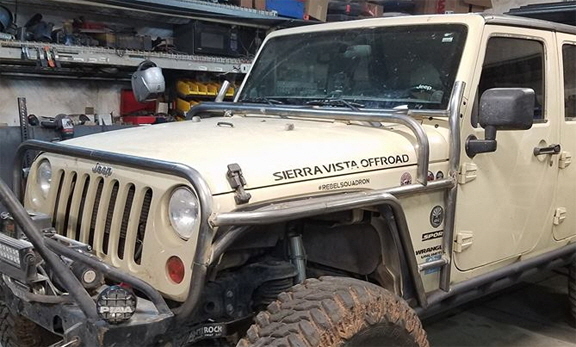 Our custom rock sliders, Jeep armor, boat sides, stingers, bumpers, roll bars, trailers, and buggy chassis fabrication are done in Southern Arizona. Many of our clients are from Tucson, Phoenix, Sierra Vista, Marana, Oro Valley, Catalina, Vail, and Rio Rico. 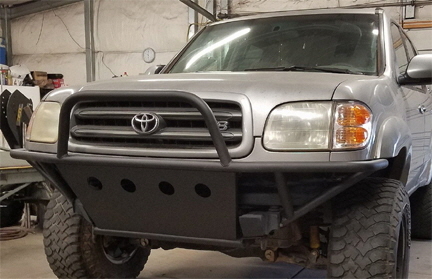 We fabricate using MIG and TIG welding on steel plate, bulletproof armor, tubes, tubing, laser cut engineered metals, suspension and axle trusses. We are the fabrication welders that make the 6x6 Jeep, crawler haulers, and Jeep armor, for desert, off road, 4x4, and four 4 wheeler action! 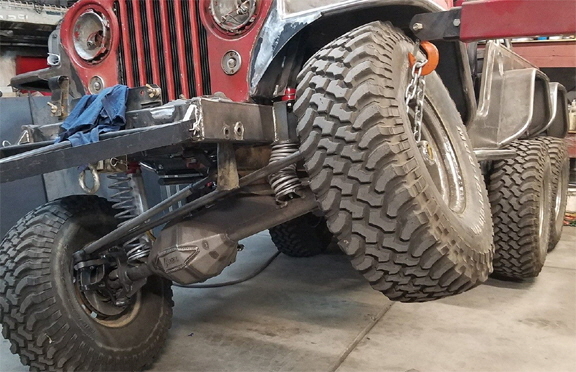 Our custom suspension prowess allowed us to build the popular 6 wheel drive Jeep. 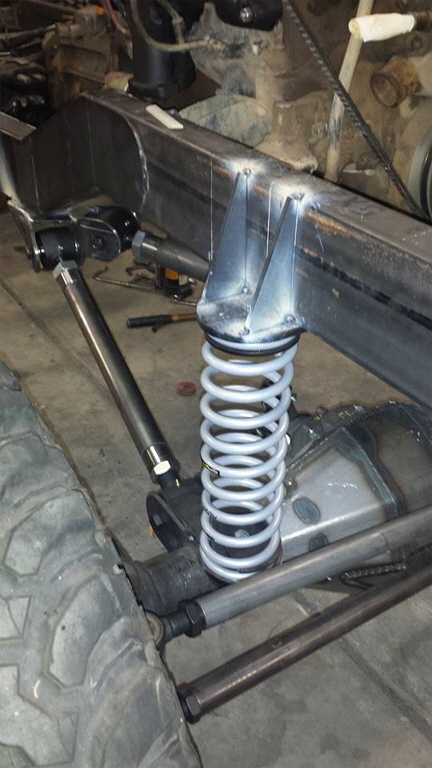 We also create custom 3 and 4 point, leaf spring, and high articulation trucks. Our clients champion the ramp at many of the non mall crawler events that we sponsor. Be like an off road pirate with rails! 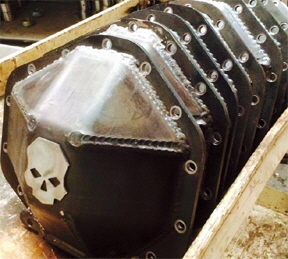 We don't offer kit work, we weld engineered steel into place. 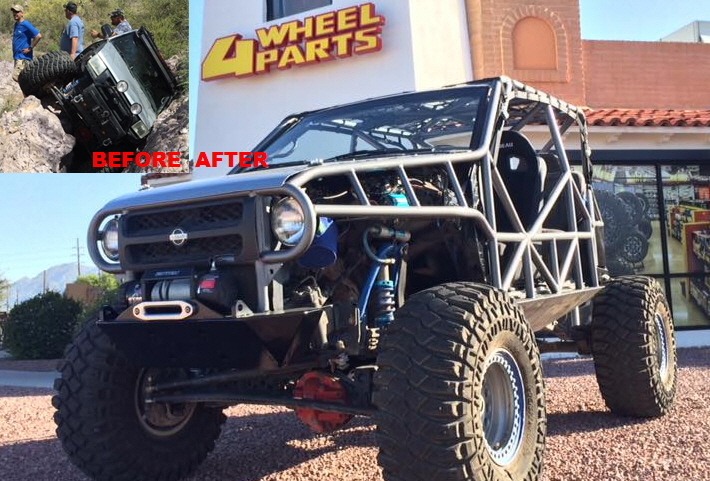 We fabricate off road for CJ, Willys, Wagon, Pickup, VJ, DJ, FC, FJ, SJ, C101, C104, XJ, MJ, YJ, ZJ, TJ, WJ, KJ, WK, XK, JK, JKU, MK, KK, KL, BU, (5, 7), Commanche, Cherokee. LEGAL DISCLAIMER - CLICK HERE. / FAQ - CLICK HERE. 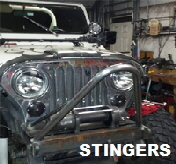 Sitemap.xml Tucson, Phoenix, Sierra Vista, Soutern Arizona Jeep Armor Fabrication Page. Jeep Tow Bar - Available for any need. SPONSOR OF MANY OFF ROADING EVENTS IN SOUTHERN ARIZONA. PROVEN QUALITY! 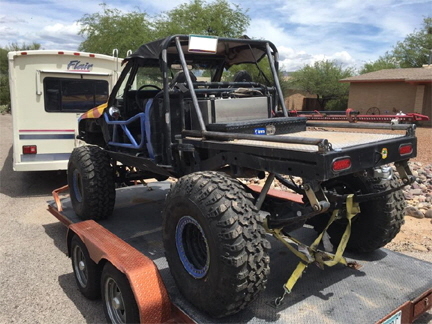 CUSTOM ROCK SLIDERS, JEEP ARMOR, BOAT SIDES, STINGERS, BUMPERS, ROLL BARS, TRAILER BUGGY CHASSIS FABRICATION IN TUCSON, PHOENIX, SIERRA VISTA, AND SOUTHERN ARIZONA. LEGAL DISCLAIMER: All services and products offered by R&W Custom Sliders and Off Road are considered to be experimental and are for off road use only. It is up to the customer to decide how to use the products and services. R&W accepts no liability.